640 pp. Houghton Mifflin. $29.99. Once upon a time, a long, long time ago, I was the mother of three young children, all under the age of four. It was like living in a spin cycle. Nothing–shoes, toys, even sandwiches–ever stayed in one place for very long. Even books sometimes seemed to whirl from place to place. One day for no apparent reason at all, my Betty Crocker Cookbook started tumbling from a kitchen shelf and landing in the wastebasket. Looking back, I see that the problem was probably a tilted and overcrowded shelf, but at the time it felt intentional. I couldn’t make a move without that cookbook flinging itself off the shelf. I’d put the baby in the high chair–and Betty Crocker would fall in the wastebasket. I’d rescue the cat from being pushed up and down the hall in a cardboard box–and Betty Crocker would fall in the wastebasket. I’d lift the toddler out of the kitchen sink where he’d climbed when I was putting the baby in the high chair and rescuing the cat–and Betty Crocker would fall in the wastebasket. It was exasperating. Especially on a hot, sticky August day. But of course I couldn’t. I needed the toll-house chocolate chip cookie recipe. And the Snickerdoodle recipe. And I especially needed the recipe for what Betty Crocker called “Rich Egg Bread,” a beautiful braided bread, sprinkled with poppy seeds, a bread I later learned to call Challah. So late that night I rescued my Betty Crocker Cookbook from the wastebasket and stored it safely in a drawer. Now, a revised and improved edition has been published. 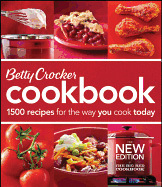 It’s called Betty Crocker Cookbook: 1500 Recipes for the Way You Cook Today. It’s filled with new features, new recipes and links to online instructional videos. There are even 350 step-by-step color photos. But don’t worry, the old favorites are still there. You’ll find Rich Egg Bread on page 118 and Snickerdoodles on page 190. It’s a helpful, practical and beautiful cookbook. Just be sure to store it on a very level shelf.